I was actually really excited when I read this month’s challenge. I’ve never had a true steamed pudding, so this was definitely all new for me. I decided to try both a savory and a sweet, since they both sounded interesting, and because I did them on one of my Friday’s off, I made them both in the same day. 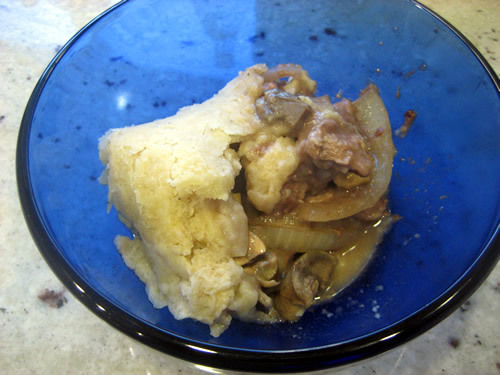 I made a steak and mushroom pie (The recipe the hostess suggested called for steak and kidney, but I’m not a fan of kidney, so…mushroom, it was!) 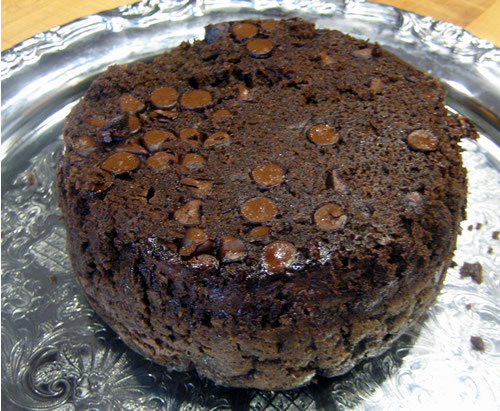 for dinner and for dessert I made a steamed chocolate pudding. 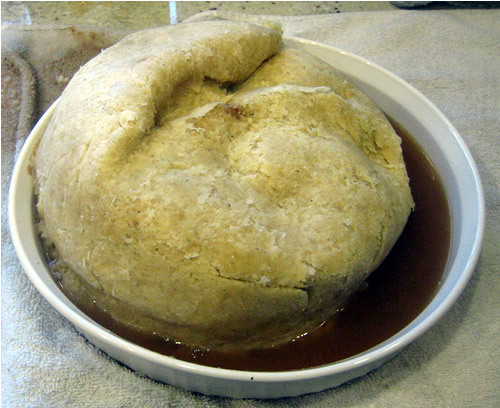 For the meat pie, I will confess – I did not use suet. It’s not that I had any aversion to using the stuff; it’s just that I’ve got a can of Crisco in the cupboard that doesn’t get used very often, and it seemed to make more sense to just use what I had. Mixing the crust for the meat pie was pretty simple, which is a plus for me since I usually do not have much luck when it comes to making pie crust. 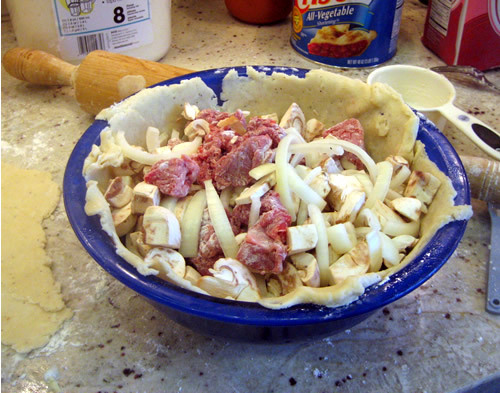 I rolled it out (after carefully flouring the counter) and got it into one of my larger mixing bowls with a minimum of tearing, and then filled it with a mix of sliced steak, mushrooms, and onions. The whole point of this challenge was to steam the dishes. I have a countertop vegetable steamer, but it’s certainly not large enough for an entire meat pie. 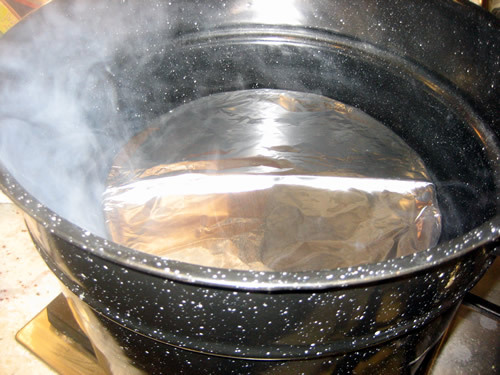 So I dragged out my giant canning kettle, covered the pie in the mixing bowl with aluminum foil, placed it on top of an upturned old aluminum pie pan, and poured boiling water in around the sides. Of course, getting it *out* of the pot later was a bit of a challenge. Apparently true pudding bowls have a ridge around the top where you can attach some rope or a handle. I just made due with two large potholders and some very careful hand placement and did not manage to either spill it, or burn myself. Trust me when I say that those count as huge achievements for someone as clumsy as myself. And removing it from the bowl didn’t help much in the looks department either. Plus, since it was bound to happen at some point during the process, I did manage to spill gravy as I was upending it onto the serving dish. Luckily it all ended up on the dishtowel I put on the counter underneath the dish, for just this possibility. And here is what it looks like inside. Sadly, not much more appetizing at this view either. The verdict – eh. The pastry was pretty much tasteless and kind of gummy in places. I suspect that was mainly my fault, since I went really light on the salt and pepper. Neither my husband or I was all that thrilled with it. We picked kind of halfheartedly at our dinner and I didn’t finish my piece. 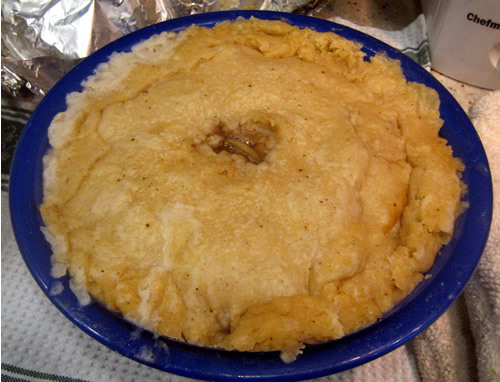 I put the rest of the pie into the oven and baked it for a while, which at least made the crust look slightly less disturbing, but did not otherwise do much to improve the flavor. Ah well. 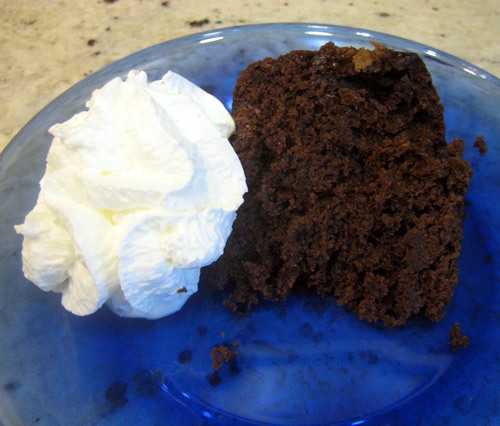 The chocolate pudding, however, was more of a success. For one thing, it was smaller, so I could put it into a little glass dish on top of a folded up dishcloth, inside one of my regular pots. After 1 1/2 hours of steaming (and one scary moment when I came into the kitchen and realized all the water had steamed away – added water ASAP and all was well), it puffed up beautifully. It isn’t the prettiest pudding, since there was a little crumbling as I was unmolding it. But it tasted just fine, with a little dollop of whipped cream on the side. 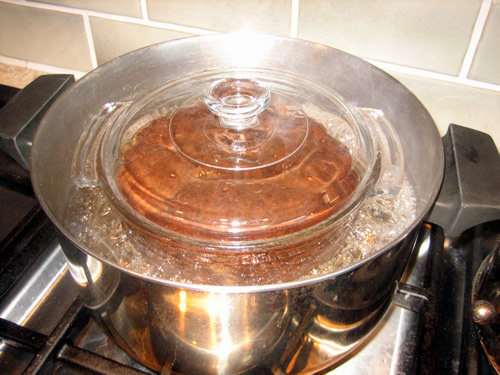 I could see doing the steamed cake again – that was fun, and there are several variations I’ve found that look delicious. I’m still pondering the pastry version, however. 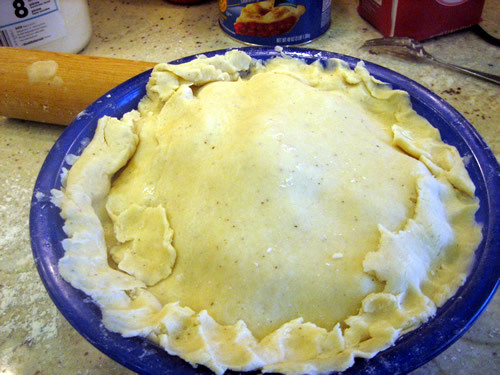 I’m sure I could make some modifications to make the flavor more appealing – add more seasoning to the pastry dough; make a roux for the filling and add more seasonings in there too – but it feels like the steaming part seems a bit hassle when it would take so much less time to just pop it into the oven and bake. All in all, however, this was a fun challenge and I’m glad I had the opportunity to do something I’ve never done before.